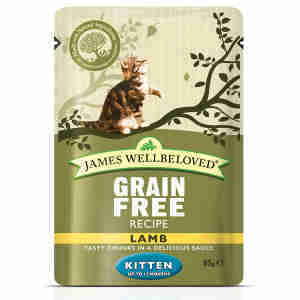 James Wellbeloved Kitten Lamb Pouch Complete dietetic wet feed for kittens. A wet food with the bonus that it is hypo-allergenic. With selected protein source (lamb) and selected carbohydrate sources (potato and cassava) it is a dietetic food, excellent for the reduction of ingredient and nutrient intolerances. We suggest that the food be tried for a period of 3 to 8 weeks. If the signs of the food intolerance disappear, continue feeding indefinitely. My 5 month old kitten loves this food. Very happy with the good quality ingredients used at such a competitive price. Highly recommended. My young kitten absolutely loves this food. I was able to make the changeover with no adverse affects the to him at all. High quality product at a really good price. Would wholeheartedly recommend. The kittens seem to like it! Good food, goes down well at meal times. Like to buy in bulk so we can store it up and make less frequent orders. The price at Pet Supermarket is excellent, I can't find better. My kittens love this, their coats are very shiny and healthy. I also feed them the JWB kitten dry which they also love. My rescued kitten started flatulate a lot and having diarrhea after being fed with Felix kitten pouches, which was the best one I found in my supermarket. A quick search showed that most brands put grains in the food which apparently is bad for their digestion. I found JW at a pet shop which doesn't, as well as other products. With great surprise it solved all problems in couple days. It would be good if JW had more varieties but it is a very good product. Unfortunately I never found it in supermarkets.